Some 15 miles beyond Tulsa, you will arrive at Sapulpa, Oklahoma, a city proud of its Route 66 and Native American heritage. Five countries have flown their flag over this area over the centuries – Spain, France, England, Mexico, and the United States of America. During the Civil War, the Choctaw Indian Nation flew its flag over the territory also. Sapulpa’s history is rich in Indian and early American folklore. Sapulpa got its start in 1850 when Jim Sapulpa, a Creek Indian, came to the area from Alabama. Establishing a farm on Rock Creek, about one mile southeast of the present city, he soon operated a store in his home, hauling supplies from Fort Smith, Arkansas. By the treaty of 1865, the Creek Indians gave the right-of-way to the St. Louis-San Francisco Railroad and the railway extended its line to the present site of Sapulpa in 1886. 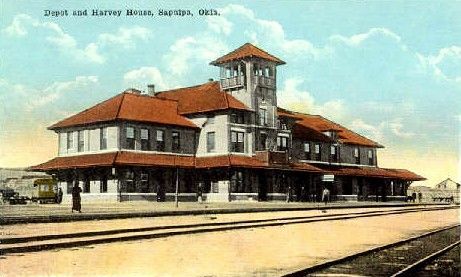 Though the terminus was not given an official name in the beginning, the railroad men called it Sapulpa after the area’s first settler, and it soon became known as Sapulpa Station. Before long the city became an important cattle-shipping center and a Fred Harvey Hotel operated at the railroad station. In 1889 a post office was opened and the town was incorporated in 1898. Although oil had been found at Chelsea in 1889, Muskogee and Bartlesville in 1897, and Red Fork in 1901, the territory was not recognized as a great oil reserve until the opening of the Glenpool Field, four miles southeast of Sapulpa, in November, 1905. This oil boom fostered Sapulpa’s greatest period of growth. The oil boom, the Frisco Railroad, and the addition of several brick and glass plants combined to transform Sapulpa from a sleepy little village into a bustling community of 20,000 by the mid-1920s. 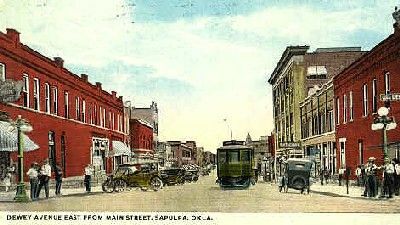 Most of the buildings in downtown Sapulpa were erected during this boom period. Sapulpa has long been known as “The Crossroads of America,” sitting at the intersection of U.S. Highway 66 and U.S. Highway 75. In the days before interstate highways were constructed, Route 66 was the main east/west highway of the western United States and U.S. 75 was the main north/south highway, running from Canada to the Gulf Coast at Galveston, Texas. Today, the city is still a major crossroad as five major highways converge in the town. Sapulpa, Oklahoma Main Street, Kathy Weiser-Alexander, January, 2011. Today, this Main Street City of some 20,000 people prides itself on its character shaped of three historic factors – Indians, railroads and oil. The town has received ten statewide awards for its efforts in preservation and architectural rehabilitation. As you pass through this beautifully preserved community, you will also find a number of artistic advertising displays on its many vintage buildings. 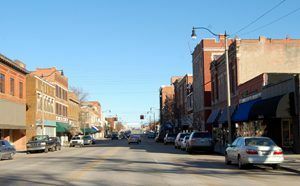 Special events are held throughout the year including summer concerts on Main Street and the popular Route 66 Blowout, an annual event held in downtown Sapulpa since 1990. The event celebrates the nostalgia of the Mother Road with a well-attended car, motorcycle and truck show; art show and sale, historic walking tours, live music, crafts and commercial vendors. Sapulpa was perhaps best known as being the home of globally recognized Frankoma Pottery. For decades, free factory tours were offered to visitors, so they could watch skilled artisans make pottery as they had since the 1930s. However, after years of decline, Frankoma Pottery closed in 2010, and its contents were auctioned a year later. Frankoma’s pottery can still be found in antique stores and homes across Oklahoma and even the nation. While visiting this Main Street City, be sure to make a see the Waite Phillips Filling Station Museum. Built in 1922 by Waite Phillips, the building has been restored by the Sapulpa Historical Society and houses automobiles from the 1920s. It is located one block off historic Route 66 at 26 E. Lee Avenue. For more history, visit the Sapulpa Historical Museum, situated in an old 1910 hotel, which features exhibits dioramas of the early-day Frisco Railroad and 1894 Sapulpa town site, a 100-year pictorial history of Sapulpa, Native American and African-American photo histories, and much more. The museum is located at 100 E Lee Avenue. 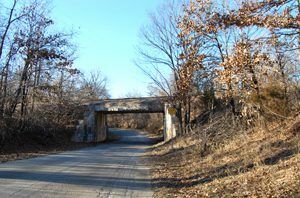 Three miles west of Sapulpa, an old alignment of Route 66 follows what was once called the Ozark Trail and, today sometimes called the “Father of the Mother Road.” This old concrete ribbon once carried 3.3 miles of Route until the early 1950s. To access this old alignment, travel 1.2 miles west of the Oklahoma 66-Oklahoma 97 intersection in Sapulpa. 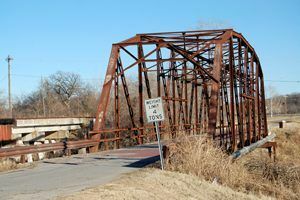 The old trail begins at the 1921 steel-truss Rock Creek Bridge. Still complete with its old red brick pavement, this twelve foot wide rusting hulk can still be driven across. Just beyond the bridge are the remains of the long abandoned TeePee Drive-In Theater. The old pavement continues to meander beneath an old 1925 railroad trestle, through wooded areas dotted with just a few secluded houses, before merging back into Oklahoma Route 66. An old alignment of Route 66 which was once part of the Ozark Trail is just west of Sapulpa, Kathy Weiser-Alexander, January, 2011. The old 1921 Rock Creek Bridge can still be driven across, Kathy Weiser-Alexander, January, 2011. Sapulpa is also home to two lakes – Pretty Water that provides excellent trout fishing, and Lake Sahoma, where camping, fishing, and boating are available. Continue your journey of the Mother Road beyond Sapulpa to Kellyville, Oklahoma. © Kathy Weiser/Legends of America, updated February, 2013 with additional edits by Ron Warnick, Route 66 News.